One thing I've noticed about Scandinavians during this last month: they like meat. A lot of it. Oh and potatoes. But mostly meat. And this Danish dish is no exception. Not that I have a problem with meat. Far from it. It's just a little bit more than I'm used to. I mean stuffing beef with more beef? That's meatlovin' dedication! These were a nice change of pace, although if I'm honest, not my favourite. This will be my last submission for the Regional Recipe Round-up for October, hosted by Eats Well With Others and originally created by Blazing Hot Wok. 1. Mix beef egg, salt, pepper and nutmeg until egg is evenly distributed throughout the meat. Spread over the beef schnitzels and top with the leeks. 2. Roll schnitzels up and tie with string or secure with toothpicks. Place in ovenproof dish, pour over beef stock and spoon cranberry jam all over the meat. Cover and bake at 180C for 45 - 60 minutes or until done to your liking. 3. Remove from oven and strain the liquid into a microwaveable jug. Using some of the liquid, mix with flour to form a paste, then add to the rest of the liquid. Mix and microwave on high for 1 - 2 minutes, or until sauce thickens, stirring once or twice. 4. 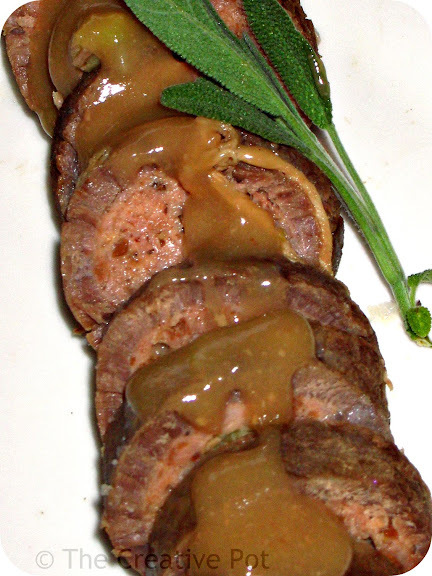 Serve beef rolls warm, drizzled with the gravy. That is a very meaty dish and can work well so a special Sunday lunch.vy looks yummee!! Meaty is an understatement for this one! ;-) I think it would be best to increase the serving portions on this one and just let everyone have one beefroll - it would be a lot more manageable for the non-diehard carnivores amongst us.